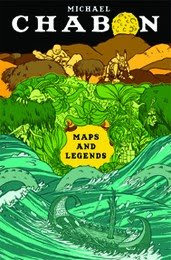 Maps and Legends by Michael Chabon. "I started to write The Mysteries of Pittsburgh in April of 1985, in Ralph's room. Ralph was the Christian name of a man I never met, the previous owner of my mother's house on Colton Drive, in the Montclair District of Oakland, California. He had died, somehow or other, shortly before his house was sold. I always pictured him as a stooped, soft-spoken man in a cardigan, scorned by the world, who retreated to his laboratory where he turned into Ernest Thesiger and called wild Transylvanian lightning down from the skies. His so-called room was in fact a crawl space, twice as long as it was wide, and it was not very wide. It had a cement floor and a naked light bulb. It smelled like dirt, though not in a bad way--like soil and cold dust and bicycle grease. Most people would have used it for suitcases and tire chains and the lawn-darts set, but at some point this Ralph had built himself a big, high, bulky workbench in there. He built it of plywood and four-by-fours, with a surface that came level to the waist of a tall man standing. It might have been a fine workbench, but it made a lousy desk, which is how I used it. I was living with my mother and my stepfather that spring, working as an assistant in my stepfather's optometry office and trying to get the hang of California. I had moved from Pittsburgh in December with the intention of applying to an MFA program out here. At the University of Pittsburgh I'd had three great writing teachers--Dennis Bartel, Eve Shelnutt, and Chuck Kinder--and of them Bartel had an MFA from UC Irvine and Kinder had studied writing at Stanford. Both gentlemen had said they would put in a good word for me at their respective alma maters. I'm sure Kinder did his best, but his effort could not avail, and in the end I found myself headed to UCI. That winter I had been down to check out Irvine, whose writing program was staffed by a couple of novelists, Oakley Hall and MacDonald Harris. Of the seven first-year MFA candidates I met during my brief visit--they would of course be second-years when I showed up the next fall--all were at work on novels (three of which, by my count, were subsequently published--a pretty high rate). I rode the ferry and ate a frozen banana at Balboa Island, looked at the ocean, and wondered if Southern California would ever feel less strange to me, less of a place where people I would never know led lives I couldn't imagine, than Northern California did. There were lots of young women walking around in swimsuits and negligibly short pants and I suppose I probably wondered how many of them I would never get to sleep with. I was kind of on a losing streak with women at the time. I was in a bad way, actually. I was lonely and homesick. I missed Pittsburgh. I missed the friends I had made there, friends of whom I felt, with what strikes me now as a fair amount of drama-queenliness, that 1) I would never see them ever again on this side of the River Styx, and 2) that they were indissolubly bound to me by chains of fire. My loneliness and homesickness were of intense interest to me at the time, as were young women in short pants, novels, and my eternal-yet-forever-lost friendships, and when I read a page of Remembrance of Things Past (as it was then known), the book that was my project for the year, I felt all those interests mesh like teeth with the teeth of Grammar and Style, and I would imagine myself, spasmodically, a writer. I hope you can infer from the above description that I was not yet twenty-two years old."